In the smiley face portion of the pizza box, pretend there’s a pizza smiling back at you. You will be smiling at the empty box once you give this a try. 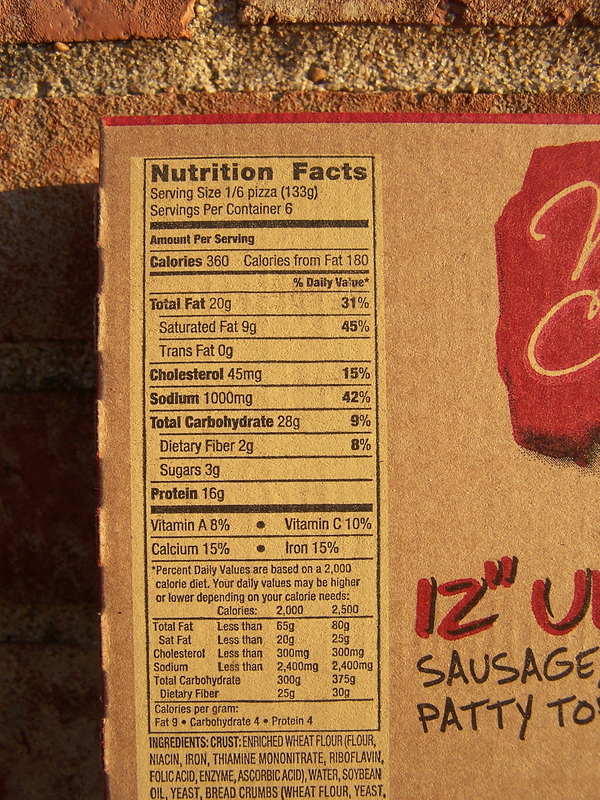 Store pizzas are usually in the category of Ramen noodles, something that provides calories. Beyond that, some of the more expensive store pizzas even start to almost taste good. Underline start and almost in the preceding sentence. With Papa John’s and Domino’s, and hopefully some of your local pizzerias, selling a cooked ready to eat tasty quality pizza for little more than a store pizza, it’s hard to justify turning on the oven to make one yourself. However, the next time you’re in the mood to do it yourself, give ALDI a try. Someone at work clued me into this pleasant surprise via their friend’s endorsement. Word of mouth. I liked the first one I tried and still like the second. Unlike many store pizzas, the toppings are truly piled on and not painted on. Twenty-eight ounces total weight for the 12 inch size. There’s plenty of meat and cheese to chew on. And the chewing is filled with some good tastes as well. 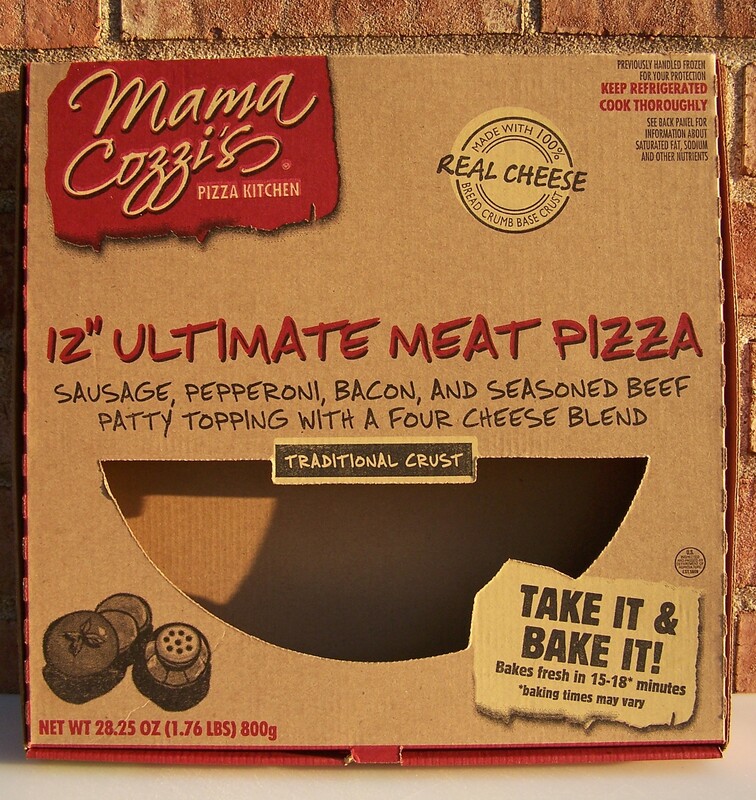 Sausage, pepperoni, bacon, seasoned beef topping and four kinds of cheeses, according to the package, provide both the calories and the flavor. The ingredients list will take about five minutes to go through if your eyes are good enough to read the small print. The downfall of course is the crust. The crust is better than most store pizzas, but still far from pizzeria quality. For whatever reason, this is not a frozen pizza. It’s found in the refrigerated meat section. If you want to store it in your freezer, you can. Just remember to thaw it out before cooking. Otherwise the intent of selling it fresh (refrigerated) seems to be that it will be cooked and eaten in just a few days. That works also. Take note of the salt content. It approaches the potency of the Dead Sea at 1000 mg (a full gram) per slice. According to the USDA seal, Richelieu Foods makes this pizza for ALDI. Follow the Wikipedia link and you’ll find Richelieu makes about 50 million private label pizzas a year for various stores. At 360 calories a slice, and 6 slices per pizza, there’s enough nutrition for two or three people. In fact, there was enough filling nutrition to not feel the need to eat breakfast the next morning. Have a few beers with the pizza, hey it’s pizza – what goes better than beer with pizza, and you’ll have two reasons not to eat breakfast the next morning. Although not tried, the 16 inch size should easily feed another person or two. If you’re new to ALDI, here’s a link with some pointers. Maybe with the next pizza I’ll remember to take a picture before eating the pizza. Maybe not. This entry was posted on 10/27/2011 at 23:54 and is filed under ALDI, Recipes, food, cooking and related items. You can follow any responses to this entry through the RSS 2.0 feed. You can leave a response, or trackback from your own site. My husband and I tried this pizza in light of all the good reviews. BIG MISTAKE! The crust reminded me of Totinos,the cheap 99 cent pizza you can get a Kroger. Crappy crust with an attempt to disguise it with better toppings.